Despite recent findings to the contrary, a new study in the British Journal of Dermatology has found that eczema is likely not associated with an increase in cardiovascular risk factors or diseases. Researchers analyzed the records of 259,119 adults aged 30-74 in the Canadian Partnership for Tomorrow Project. A diagnosis of AD was associated with somewhat reduced risk of stroke (0.79 times the odds), hypertension (0.87 times), diabetes (0.78 times), and heart attack (0.87 times). The authors emphasized, however, that this does not mean that AD is protective—given the mixed evidence accumulated by researchers, the best conclusion is that AD is likely not positively associated with cardiovascular disease. The findings are based on a statistical analysis that accounted for confounders including age, gender, ethnic background, body-mass index, smoking, alcohol consumption, sleep, physical activity, and asthma. The suspicion that AD might be associated with cardiovascular disease has likely arisen from the better-substantiated association researchers have found between psoriasis and cardiovascular disease, the study authors note. But while the two inflammatory skin ailments share some clinical similarities, they work differently at the molecular level, which might explain why only one may be associated with cardiovascular disease. The researchers plan to further study whether AD severity might correlate with cardiovascular disease. 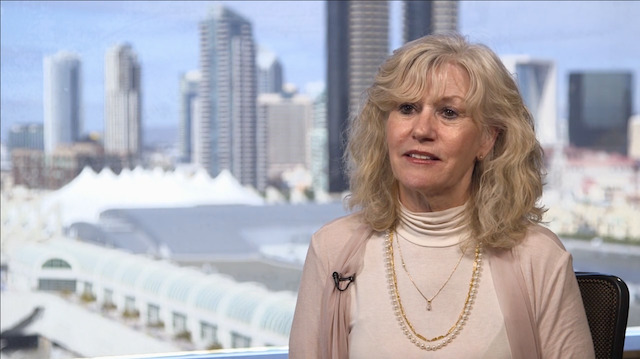 Two Phase 3 trials show that tildrakizumab is efficacious and well-tolerated in patients with moderate to severe chronic plaque psoriasis. 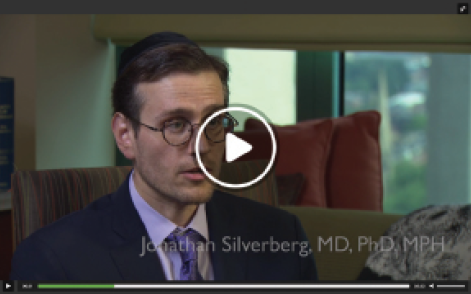 More than 60 percent of all patients who received the active medication showed improvement, compared to less than 10 percent of patients who received placebos. The findings appear in the journal Lancet. Tildrakizumab is an investigational humanized, anti-IL-23p19 monoclonal antibody that binds specifically to IL-23p19 and is therefore designed to selectively block the cytokine IL-23. The parallel double-blind randomized controlled studies, known as reSURFACE 1 and 2, tested tildrakizumab for its ability to clear up and control psoriasis in patients with moderate to severe disease. More than 1,800 patients were enrolled in the trials conducted at 250 sites throughout the world. Patients were randomized to one of three groups; one group received 200mg tildrakizumab, one received 100mg, and one received placebo. On average, patients started the study with 30 percent of their body covered with psoriasis; 12 weeks later, 65 percent of those under active treatment had skin that was clear or almost clear—a 75 percent improvement as measured by the Psoriasis Area Severity Index. Fewer than 10 percent of those given a placebo achieved this level of improvement. The FDA has cleared the Clarify Medical Phototherapy System for marketing, and the new smart, at-home UVB phototherapy system will be available to patients with chronic skin diseases in November. Clarify’s proprietary technology allows patients with psoriasis, vitiligo, and eczema to receive UVB phototherapy in their homes, linked to their physicians and to Clarify support services through their smartphones. Clarify has begun meeting with existing and prospective shareholders in preparation for a Series A Financing. The company is raising $10 million to support product launch in November. It expects to close the offering in near future. Researchers have identified mutations in the CARD11 gene that may lead to atopic dermatitis. The findings, reported in Nature Genetics, also suggest that some of these defects could be corrected by supplementation with glutamine. Scientists from the National Institute of Allergy and Infectious Diseases (NIAID), part of the National Institutes of Health, and other institutions analyzed the genetic sequences of patients with severe AD and identified eight individuals from four families with mutations in the CARD11 gene, which provides instructions for production of a cell-signaling protein of the same name. While some people with these mutations had other health issues, others did not, implying that mutations in CARD11 could cause AD without leading to other issues often found in severe immune system syndromes. The scientists then set out to understand how the CARD11 mutations contribute to AD. Each of the four families had a distinct mutation that affected a different region of the CARD11 protein, but all the mutations had similar effects on T-cell signaling. With cell culture and other experiments, the researchers determined that the mutations led to defective activation of two cell-signaling pathways, one of which typically is activated in part by glutamine. Growing cultured T cells from patients with CARD11 mutations with excess glutamine boosted mTORC1 activation, a key part of one of the affected pathways, suggesting the potential to partially correct the cell-signaling defects that may contribute to AD. 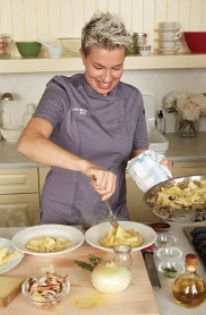 There’s likely a lot that diehard foodies know about chef Elizabeth Falkner. After all, her resume is impressive. She has competed on Food Network’s “Next Iron Chef, Redemption,” “Iron Chef America” and “Next Iron Chef, Super Chefs,” “Food Network Challenge,” and Bravo’s “Top Chef Masters.” She was the first American to win the “Freestyle Neapolitan Pizza” category of the World Pizza Championship in Naples in 2012. But there’s something many epicureans likely do not know about the award-winning chef. Falkner, now 51, was diagnosed with moderate to severe atopic dermatitis in her 30s, and at the time, her doctor told her to give up cooking due to its symptoms. It wasn’t until very recently that she finally got the pain and itching under control. Now she is speaking out about the disease that almost cost her her career as the face of “Understand AD,” a national awareness campaign focused on educating people about moderate to severe AD. The campaign is sponsored by Sanofi and Regeneron Pharmaceuticals in partnership with the National Eczema Association. Falkner’s first symptom was red, flaky itchy and extremely painful lesions on her legs that soon spread to her hands. “There were these itchy tiny volcano’s all over my legs that I had to try to leave alone,” she recalls. The stress of running a restaurant, constant hand washing, and hot oven temperatures only made matters worse. “I felt mostly anxious as AD is something that may go away a little but it is sort of always there as a constant,” she says. She tried everything from steroids to oils to a laundry list of over-the-counter products. Nothing helped in any meaningful way. “I didn’t go back to the doctor for 15 years out of frustration,” she says. At the time of her diagnosis, nobody got just how difficult it was to live with AD. 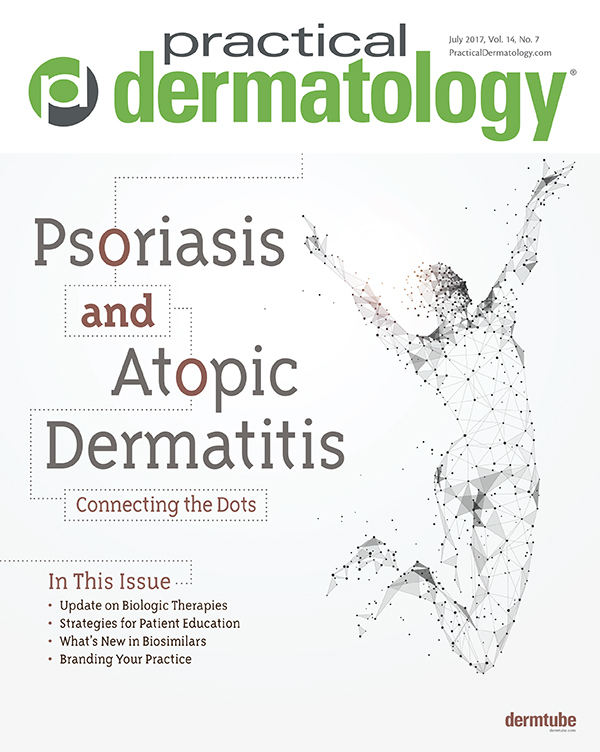 “It’s a very alienating disease,” she tells Practical Dermatology®. Fortunately, the understanding of the pathogenesis of AD has improved, and new treatments are now available. Falkner has also found a much more empathetic doctor, and hopes that by speaking up and speaking out, she can help others with AD feel less alone than she did. “Doctors need to understand the psychological impact of AD,” she says. “They need to ask how the condition affects your life, rather than just diagnose it,” she says. While medication helps, stress reduction has also been a career-saver for Falkner. “I exercise a lot, and do yoga or Pilates to control stress,” she says.